Stephen Hawking says he was wrong about a key argument he put forward 30 years ago on the behaviour of black holes. He will tell the Dublin meeting that he now believes black holes may after all allow information to get out. His new findings could even help solve the "black hole information paradox", a crucial puzzle of modern physics. Professor Hawking has not yet revealed the detailed maths behind his new ideas, but some points have leaked out from a seminar he gave at the University of Cambridge. 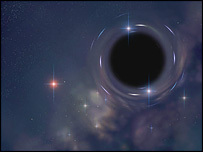 Gary Gibbons, another physicist at Cambridge who attended the seminar, said Hawking's newly defined black holes did not have a well-delineated "event horizon" that hid everything in them from the outside world. "It's possible that what he presented in the seminar is a solution," Professor Gibbons told New Scientist magazine. "But I think you have to say the jury is still out." 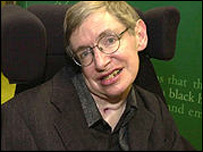 Professor Hawking's own work was responsible for generating the black hole information paradox. In 1976, he calculated that once a black hole forms, it radiates energy and starts losing mass. This radiation gives no information about matter inside the black hole and once the hole disappears, all the information goes with it. "It used to be thought that once something had fallen into a black hole it was gone and lost forever and the only information that remained was its mass and spin," the Lucasian Professor of Mathematics at Cambridge told the BBC. "But some time ago I discovered that black holes are not that black after all. They give off what has been called 'Hawking radiation'. Because of this emission black holes will lose mass and eventually evaporate completely. "The Hawking radiation seemed to be random and featureless so it appeared that all information about what fell into a black hole was lost." But this runs contrary to the laws of quantum physics, which describe the behaviour of the Universe at the smallest scales. These dictate that information can never be completely lost. "If information can be lost it has important practical and philosophical consequences," he added. "We could never be certain of the past or predict the future precisely. A lot of people therefore wanted to believe that information could escape from a black hole but they didn't know how it could get out." For years, the physicist argued that the extreme gravitational fields of black holes somehow overturned the quantum laws. Now, he has dropped this idea. Professor Hawking's new black holes never completely destroy everything that falls in. Instead, they continue to emit radiation for extended periods, and eventually open up to reveal the information within them. "I have been thinking about this problem for 30 years, but I now have an answer to it," he explained. "The black hole only appears to form but later opens up and releases information about what fell in, so we can be sure of the past and we can predict the future." The U-turn could cost Professor Hawking an encyclopaedia. He and theoretical physicist Kip Thorne, of the California Institute of Technology, made a bet on the subject with an opponent of the idea, John Preskill, also of Caltech. Hawking and Thorne are expected to present Preskill with an encyclopaedia of his choice. "Professor Stephen Hawking is proposing a new theory of black holes"